If there’s any more argument to be made about getting third-party insurers — whether government or private insurance — out of most routine health care, here’s one. And it’s a true story. My son, Zane, has Type 1 diabetes, treatment of which requires frequent blood work. His last panel included 17 different types of blood tests from one draw. Zane had the blood drawn on Dec. 6, 2017, from a lab affiliated with Covenant HealthCare hospital system of Saginaw. The bill arrived in late January, informing me in no uncertain terms I now owe $219.41. But thank goodness my son has insurance — and will be on a parent’s insurance until he’s 26 years old, god willing. Because on page two, I learned the actual total was $1,598.86. The statement did not, however, tell me exactly how many or what kind of tests ran up a $1,598.86 tab. So I called the billing center and had them send me an itemized bill, with a per-test price breakdown. When the itemized bill arrived in the mail a few weeks later, I discovered the lab conducted 17 different blood tests from the same lab draw. For a “Thyroid Stimulating Hormone (TSH),” “Comprehensive Metabolic Panel (CMP),” and “Hemoglobin A1C,” Covenant charged $158, $147, and $83, respectively. 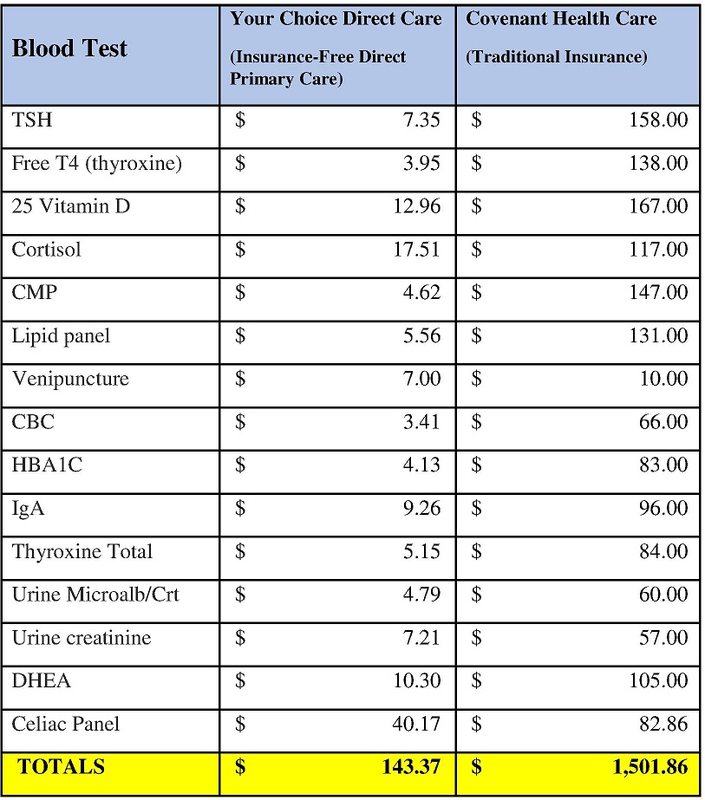 Savage offers blood work as part of his practice and lists prices of some of the more common blood tests on his website. It was nothing less than stunning to learn the three tests mentioned above that cost $158, $147, and $83 through the hospital, cost only $7.35, $4.62, and $4.13 through Savage’s DPC practice. That’s $388 under a traditional insurance-based system, compared to a $16.10 under the insurance-free system. Granted, that’s $16.10 out of pocket, but right around the price of an Applebee’s entrée, the DPC prices are far more palatable than the hospital’s bloated pricing system aimed at keeping insurance companies afloat rather than health costs low. Since the website only listed a sampling of blood tests, I sent the entire bill to Savage for comparison. The result is in the table below — he was able to compare all but one test without further investigation, so for the sake of apples to apples, a $181 charge for one test is not included below. The hospital’s total bill for 16 tests: $1,501.49. In other words, the hospital charged $1,358.49 more, or a 947.54 percent increase — for the exact same tests. On one blood draw. The only difference? An insurance company paid for most of the transaction. Not me or my son who are the actual consumers. Insurance is necessary, of course, for the expensive medical events — diseases like cancer, traumas from auto accidents, major surgeries. But what if we used health insurance only for major medical events? What if we refocused the system by taking control away from the government-insurance complex and putting it in the hands of patients? That’s exactly what direct primary care does — it refocuses the system away from making the payers happy, to making the patients happy, and making them the boss of their own health care dollars. This is easily accomplished with Health Savings Accounts, which gives patients enough skin in the game to make the best use of their health care dollars. It’s possible, but only if our policymakers drop the letters after their names and find common ground in two areas: cover everybody, not everything, allow some federal health care dollars to be used for HSAs —f or everyone, and expand the ways HSA dollars can be spent. One short-term fix for the latter is for Congress to allow HSAs to pay direct primary care fees. The IRS strictly prohibits this use of HSA dollars, however, as it insists DPC is a type of insurance “plan,” and therefore off limits to one’s own HSA money. And in a nonsensical bureaucratic loop-the-loop, the Affordable Care Act specifically states that direct primary care model is not insurance, leaving no logical reason for the IRS to continue digging in its heels about DPC. Legislation to solve this problem has languished in on Capitol Hill for more than a year. The U.S. House and Senate have similar versions of the “Primary Care Enhancement Act of 2017,” each less than one page in length and each with bipartisan sponsors. If lawmakers want to get real crazy, they should allow us to use our HSA money to pay our insurance premiums. This would nearly overnight eliminate the need for employer-based health insurance — which mainly exists for the tax advantage anyway. At the very least, using HSAs to pay our own premiums would rid human resources departments of the monumental hassles of brokering health insurance among employers, employees, insurance companies, and the government. DPC and HSAs are but small beginnings to a massive health care cost problem. But given the economic stimulus of the recent tax cut, imagine what reforming the nearly 20 percent GDP drag on the U.S. health system would do for our economy. Kathy Hoekstra is development communications officer for Pacific Legal Foundation.